Add the sugar, lemon juice and peppermint leaves together in a pitcher. Use a wooden mortar to gently mash the leaves, but don’t pound them too hard. Then add the strawberry and blackberry juice, rum, soda, ice and fresh fruit to taste, if you wish. Mix well. Serve in individual glasses. If you don't have a wooden mortar, use a wooden spoon to mash the mint with the sugar. To make the strawberry and blackberry juice, blend 1/4 cup strawberries, 1/4 cup blackberries, 3/4 cup water and 2 tablespoons sugar in the blender at medium speed until all the ingredients are well incorporated. Erica Dinho There are many mojito variations, but the traditional mojito is simply rum, mint, lemon juice and sugar. Today, I'd like to share a variation of one of the most popular Cuban drinks, adding the exquisite touch of strawberries and blackberries. 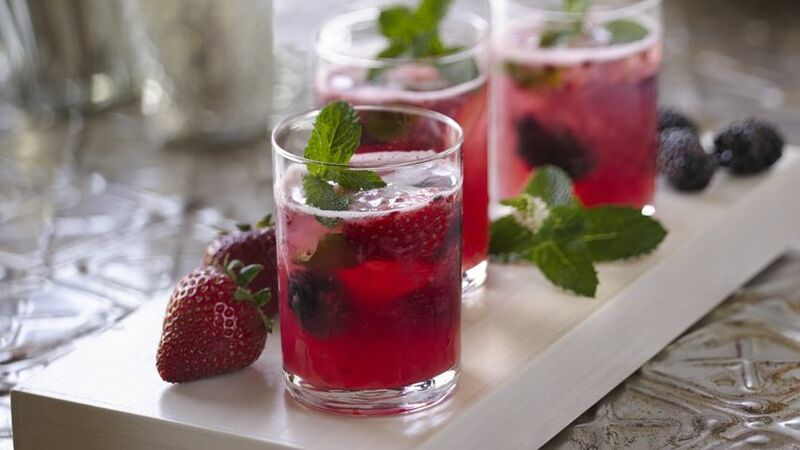 This delicious and refreshing strawberry and blackberry mojito recipe is made with fresh juice, lemon juice, sugar, rum, mint and ice. Serve this beautiful and colorful cocktail at your next gathering. I guarantee your guests will love it.